Page 2 readers, let Drew Gooden educate you about "Bossin' Up." "'Bossin' Up' means doing everything in boss style," Gooden explained earlier this summer at his Orlando home. "Whether it's on the court, [or] in the business world, treat yourself as a boss because you are the boss of your company. So you have to boss up right." The Cleveland Cavaliers forward is definitely a trendsetter, in language -- and in hair. You probably remember the strange patch of hair Gooden grew on the back of his neck last season, which he kept through Cleveland's run to the NBA Finals. The ducktail was the talk of the NBA. Sadly, Gooden eliminated the tail over the summer, for reasons he explains below in Page 2's latest edition of "Riding With..." -- our occasional series where we interview sports figures in their really cool cars. And let's just say, Gooden and his hair had quite a standoff. Since "Bossin' Up" is Gooden's motto, it should come as no surprise that Gooden has the most expensive, most "boss" vehicle so far in the "Riding With..." series -- a white 2005 Rolls Royce Phantom, complete with fur floor mats. Gooden didn't really know what type of animal fur it was, so he randomly decided it was chinchilla. Hopefully the PETA people are too busy lining animal cages with Michael Vick jerseys to notice. Anyway, in our latest Q&A, Gooden explains life in "boss" style. Jemele Hill: So what happened to the ducktail? 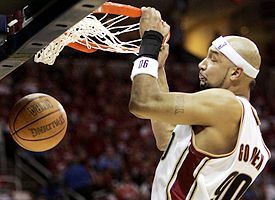 Drew Gooden: Man, I got jealous of the ducktail. The ducktail started getting more attention than me, so that's why I cut it off. Check out the flush -- and the hair patch. Were you surprised by how much attention it got? I was. But you know what? It came with the territory. If I was going to go through those drastic measures and prove to my teammates I could keep it the whole season, then I was going to do it. But I didn't think about all the turmoil and the pain it was going to cause my family. Nah, I'm just joking. Everybody was asking me why I had it. It was a big thing. I kind of kept it because we were winning. We got all the way to the Finals. We were rolling and it was kind of working for me. So it became a superstition? Yeah, exactly. Why mess up a good thing? I understand the reason you grew the ducktail is because you're a big fan of the '80s. Yes, I'm a big fan of the '80s. I'm an '80s baby. As an '80s baby, what has more value: a Trapper Keeper or MC Hammer pants? Man, both. I remember every first day of school, if you didn't have a brand new Trapper Keeper, you were going to be made fun of. That was the whole thing -- figuring out what you were going to wear the first day of school and your Trapper Keeper. But you know what? I've got to go with Hammer pants because Hammer is from the Bay Area. And when Hammer was hot I was a little kid, and me and all my homies had Hammer pants and we were in dance groups. Hammer, if you're out there listening, I'm from the Bay. I looked up to you and I still look up to you. We need to have lunch one day. So what is some of your favorite '80s music? I like Prince. I don't like too much old '80s hip-hop, unless it's N.W.A or early Too Short or a West Coast-type of group. But my iPod is full of '80s music. I'd be sitting here forever if I had to name them all. I like all types of music. One of my other passions is music. You mentioned your iPod. What do you have in there that we would be shocked to find? I got Tears For Fears in my iPod. I read you paid $300 for a Casio watch. Is that true? I didn't know how to work eBay, but I had somebody get on Ebay for me and bid on the watch. It started off at, like, $30. It got all the way up to $200 on the last day. In the final seconds of the bidding war, it got up to almost $400. I was like, man, either somebody out there really likes the '80s or I'm bidding against the guy that's selling it. I ended up getting the watch for $350. But it was special to me because it was an original watch from the '80s. One of the biggest stories this summer was [NBA referee] Tim Donaghy's connection to organized crime and gambling. What was your reaction to that? I was shocked. But then again, we know it's the reality of the world. We know this goes on. Not only in basketball, but baseball, football and all sports. I think the commissioners of all the sports have to take a deeper look and dissect those things. We can't have that polluting our sports. One thing that fell under the radar was what Andrew Bogut said about life in the NBA. Bogut said: "The public's got it right. A lot of NBA stars are arrogant and like to spend lots of money and have lots of girlfriends and all that." Do you consider that the truth? Andrew Bogut is from Australia and he grew up a certain way. He probably hasn't seen the other side of the fence that some of the guys on his team or that he's played against have seen. When certain guys' dreams come true, some guys know how to handle it and some guys don't, but you can't blame the whole NBA or your teammates for how two or three guys act. Were you at NBA All-Star Weekend? But I'm sure you were aware of what was said about it. People castigated the NBA for what went on there. Do you think the NBA's image is unfairly characterized? Yeah, but at the same time, it starts with the players. Once the media gets hold of anything, you know how that can get. Not every NBA guy is in the news every day. There are a lot of good guys in the NBA who take care of business and are professional on and off the court. One of the stories that came out of the NBA Finals was your teammate, Ira Newble, getting NBA players to sign a petition against the genocide in Darfur. Did you sign the petition? Why did you feel it was important to sign it? When I first heard about it, I wasn't educated about it and didn't have complete knowledge of what was going on, but I heard some of the stories and the horrible things happening there and I signed it. And after I signed it, I did more research and talked to Ira and helped him with some contacts to help his petition grow. Athletes seem to fear getting involved politically. Why is that? When you're an athlete, whatever you say can get out into the world fast, so you have to be careful about what you say. With politics, it's never a right answer because everybody is opinionated. As athletes, we should stay on the court, not worry about too much politics and carry out our jobs. People criticized your teammate, LeBron James, for not signing the petition. Was that fair? I don't blame him for not signing it because he had no knowledge about what was going on. You can't blame someone who has no knowledge of the facts for not signing a petition when he didn't know what he was signing for. LeBron James is a big name. I think it was a smart move. He's put in a position where he has to be careful about what he signs because it's a big deal when you have a LeBron James signature. I feel like it wasn't a wrong thing on his behalf. If you probably asked him today to sign it, he'd probably say, yeah, because he's done the research and had a chance to talk to Ira and he has a better understanding. You're half-Finnish, right? You know any Finnish? I know a little bit. My mother is from Finland and my father is from California. He met my mother in Finland while he was playing professional basketball overseas. When was the last time you were in Finland? I was in Finland seven years ago. I used to go every two years to see my family. My grandfather and grandmother are out there. Finland has a lot of trees, a lot of lakes and a lot of beautiful women. It's a good country. I like it a lot. That's part of my heritage, so it's good to go back. How are you received in Finland? A lot of people don't know I'm half-Finnish. They don't know until I tell them my mom's last name and they know right away. I'm starting to get involved in the media out there and let it be known I am of Finnish descent. Two summers ago, I tried to play on the Finnish national team, to see what the process was since I couldn't play on the U.S. team. I would have had to get a Finnish passport and get dual citizenship. But if I get dual citizenship and play for the Finnish national team, I can never play with USA Basketball. So, do I risk my U.S. citizenship and a chance to play in the Olympics to play for the Finnish national team that doesn't make it? I don't think that would be too smart. But if my years start winding down and I can't play on the USA Olympic team, I'll jump ship and try to be a Finn. Gooden and the Cavs hope to get back to the Finals this coming season, with a different result. Teams that lose in the NBA Finals sometimes come back even hungrier. Now that you've been, how will you approach this season? There will be a hunger, a desire to get back, a willingness to do whatever it takes, to sacrifice whatever to get back and win. That should be our goal. This past year, our chant in the huddle was, "1-2-3 championship!" I think this year it should be, "1-2-3 win it!" That's what we want to do -- win the whole thing. Were you worried how LeBron's commitment to Team USA might impact the Cavaliers? I don't know how LeBron does it. To jump right into the NBA season after playing the second-most minutes in the NBA two years in a row, it's tough. At the same time, he's young. He deserves it. Because he has so much of the spotlight, does it make things easier on his teammates? Since I've been in the NBA, that's all I know, is playing with a superstar. 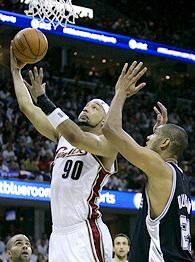 In Orlando, I played with Tracy McGrady for two years and that prepared me for my years in Cleveland with LeBron. It doesn't bother me. Actually, I like it when he leaves the locker room first so the media can attack him. I can sneak out the back because they don't care about asking me any questions. It's kind of cool having that dude on your team. People describe you as eclectic. Why is that the word used to describe you? I think my upbringing. Growing up in the Bay Area, it's the culture out there. I'm a real energetic, fun-loving guy. I get along with all my teammates. I try to make everybody laugh and keep the tone of the team comfortable.